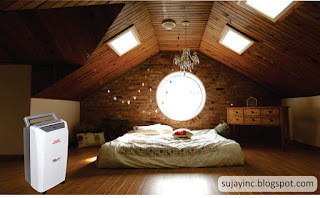 SUJAY Inc.: How to Choose the Perfect Dehumidifier for Basement. How to Choose the Perfect Dehumidifier for Basement. Now a day, Humidity is the level of moisture in the air everywhere. Excess moisture in the basement can be reason for health issues. Excess humidity level can prove to be rather harmful for your health. It can cause several diseases such as asthma and various allergies. High humidity levels can also damage the different appliances and gadgets at home, which may include cameras, clothing, books, and different electronic products. In order to stay away from the dangers of excessive moisture in the air, it is better to buy a good quality Portable dehumidifier. Dehumidifier helps to lower down the humidity levels at homes and offices. Since there are various types in the market, this dehumidifier buying guide can help you choose the best as per your needs and also can reference Dehumidifier Reviews. 1. Area Size: Do you wish to dehumidify a certain portion of your home or the entire property? It is vital to measure the area you wish to dehumidify, so that you can choose the right dehumidifier. There are dehumidifiers in the market with different capacities in terms of area size; it is advisable that you measure the area before you buy one. 2. Collected Water from the Dehumidifier: There are some dehumidifiers in the market which come with internal buckets, where water gets collected and some come with direct water draining features. If you choose one with an internal bucket, then you will have to empty the bucket from time to time. Thus, better decide the proper way to get rid of accumulated water before you make the final purchase. 3. Energy Performance of the Dehumidifier: The amount of water extracted on an hourly basis versus the total energy consumed to complete the task every hour is termed as the energy performance. In order to get the most out of the unit without wasting much power, always look for the energy performance of a dehumidifier. ‘SUJAY’ Inc. Portable Dehumidifier helps to fight against health issues. Protect your family with our Best & Tested Portable Dehumidifiers & surely your family will cover from many diseases. A good option for your home might be 10, 20, & 50 liter Dehumidifier but it is advisable do your own research to make sure it will fit your needs.